With the prospects for Korea’s exports in the coming years dimming, there is increased pressure to expand domestic demand, particularly by promoting service industries through drastic deregulation. A downturn in exports, which have shored up Asia’s fourth-largest economy in recent years amid sluggish domestic demand, could rattle it unless offset by an increase in local consumption and investment, experts say. According to recent data from the Bank of Korea, exports made a 1.8 percentage point contribution to the country’s gross domestic product growth in the first quarter of this year, compared with a 0.3 percentage point contribution by domestic consumption. Many private research institutes remain skeptical about the chances the government’s growth target of 3 percent for this year will be reached. The view they increasingly share is that the economy as a whole is entering a slowdown. Trade officials here expect Korea’s outbound shipments to record an on-year decrease in June. Last month, Korea’s exports rose 13.5 percent from a year earlier, rebounding from a 1.5 percent dip the previous month. High base effects and shorter working days are cited by trade officials as the main reasons for the on-and-off monthly declines in outbound shipments of Korean products. But experts say the many downside risks the country faces will make it difficult for its exports to remain on an upward trend. Korea’s manufacturing exporters have been struggling to cope with mounting protectionism triggered by the US, intensifying competition from Chinese rivals and the strengthening won. Recent data from the World Trade Organization showed the country’s export growth lagged behind the increase in global trade in the first quarter of this year. A growing reliance on semiconductors makes the growth momentum of Korea’s exports more fragile, with its chipmakers’ dominant presence in global markets being threatened by China’s massive investment to catch up with them. Semiconductors accounted for more than 20 percent of its outbound shipments in the first four months of the year, compared with 12.6 percent in 2016. Also casting a shadow on the outlook for Korea’s exports are downward adjustments by the World Bank and other international economic organizations of their global growth forecasts for next year, heightening the possibility that the world’s trade will also shrink. Experts say efforts should be stepped up to cushion the impact of a downturn in exports on the economy by boosting domestic demand. 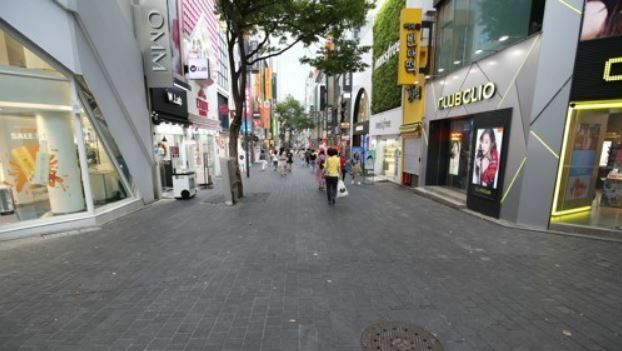 Song Young-gwan, a researcher at the state-run Korea Development Institute, said Korea needs to be in keeping with the global trend of expanding domestic markets, as shown especially in the US and China. “The country’s economic policies, including currency policy, have focused on (increasing) exports,” he noted. Korea’s personal consumption expenditure is projected to grow 2.8 percent on-year in 2018, up from a 2.6 percent gain last year, according to a KDI study. But a considerable part of the increase is attributed to ever-growing overseas spending by Korean travelers. Excluding expenditure abroad, the on-year growth in private consumption last year fell to 1.6 percent. Experts note strengthening the competitiveness of the local services sector is urgently needed to funnel money spent abroad into domestic consumption. “Potential domestic demand in service areas is not met because of the weak competitiveness of the supply side,” said Lee Geun-tae, an analyst at the LG Economic Research Institute, a private think tank. Local services sector’s labor productivity remains at about 45 percent of the level of manufacturing industries, the lowest among the 35 member states of the Organization for Economic Cooperation and Development. Services exports by Korea declined 7.6 percent from a year earlier to $87.7 billion last year, compared with a 7.2 percent increase on average for OECD members. Korea was the only OECD member that saw a reduction in services exports in 2017. Economists note President Moon Jae-in’s government should carry out drastic deregulation to promote high value-added service industries, including tourism, leisure, health care and big data marketing. According to analysis by a local research institute of the 2017 UN innovation survey, Korea lagged behind other major economies in the regulatory environment, particularly regarding employment, while strong on human capital and research and development. The Moon administration’s income-led growth policy has also proved unhelpful for stimulating domestic consumption. Its pro-labor policies such as steep minimum wage hikes have resulted in reducing mostly low-wage jobs, widening income inequality. According to figures from Statistics Korea, an average monthly income earned by the lowest 20 percent of households fell 8 percent from a year earlier to 1.28 million won ($1,187) in the first three months of the year. Choi Bae-geun, a professor of economics at Konkuk University in Seoul, said the income-led growth drive will go nowhere unless it is accompanied by strenuous efforts to reinvigorate corporate activity by forging business-friendly conditions. Educational reform is also needed to help increase domestic consumption by reducing private education expenses, which accounted for nearly 20 percent of household consumption spending in 2016, up from 10.6 percent in 2005, according to the Hyundai Research Institute, a private think tank. Experts also call for the overhauling of the taxation system -- including the scrapping of special excise taxes on car purchases and the extension of income tax deductions on credit card use -- to help boost the consumer sentiment that has been on a downturn for the last five months.